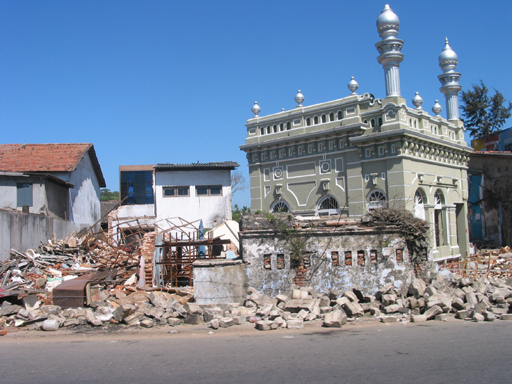 At about 09:20 local time on 26 December 2004 the tsunami that was sweeping across the Indian Ocean struck Galle harbor. We put together our thoughts on the events of 26 December, but both of us admit that even right after the event we were confused about the order in which some things occurred. 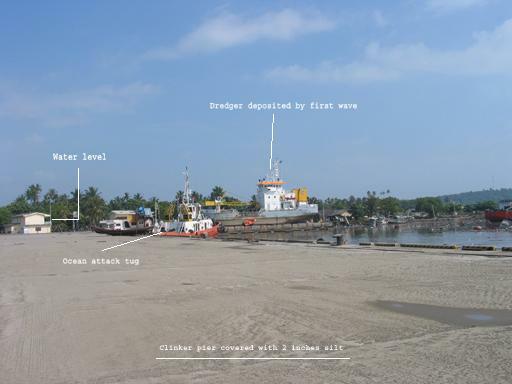 To help understand what we experienced on 26 Dec refer to the map of Galle Harbor. 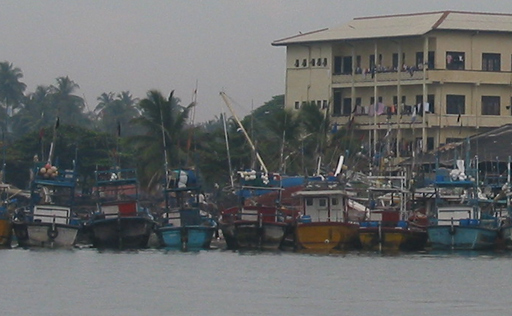 To set the scene, Galle Harbor sits in the north side of a large bay on the south coast of Sri Lanka. 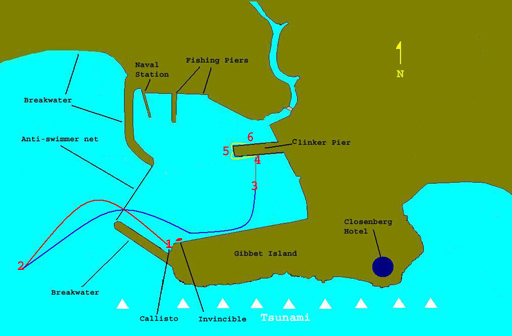 The harbor is bordered on the north and east by the mainland and on the south by a spit of land, Gibbet Island, extending to the West. The harbor entrance on the west side is partially closed by breakwaters one extending south from the mainland and one extending northwest from Gibbet Island. 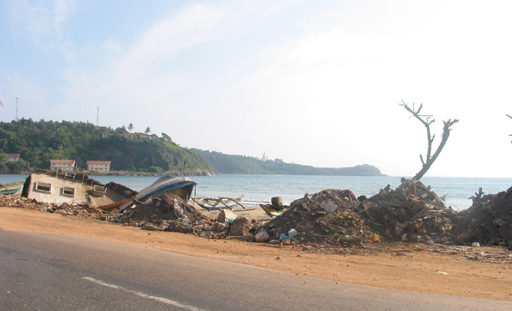 Prior to the tsunami an anti-swimmer net guarded the harbor entrance. The Navy opened this net as required to allow ships to enter and exit. 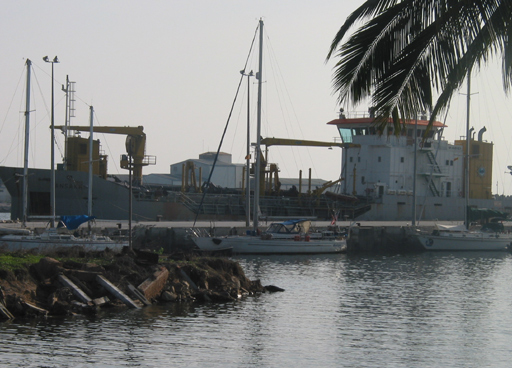 The harbor side of Gibbet Island is a large quay, used to load cement ships. Between the western end of this quay and the breakwater (1) were two floating pontoons, which were oriented east, and west. Callisto and Sula, an Italian yacht, were moored stern-to the southern pontoon and Vesna IV, a Slovenian yacht, was moored stern to the northern pontoon. 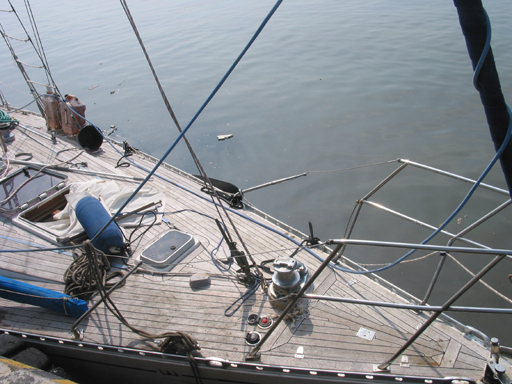 The bows of all three boats were tied to buoys anchored between the pontoons. There was a unmanned merchant ship named Invincible also at the western end of the concrete quay not 50 feet from Callisto's starboard side. 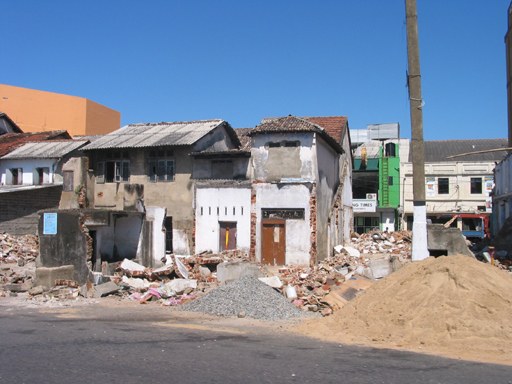 The tsunami struck from the south at about 09:20 in the morning. A huge wave estimated to be 16 to 18 feet high and containing thousands of tons of water came crashing over the Gibbet Island and the breakwater extending from it. The water came crashing into the harbor carrying all before it. Had we not been protected by this spit of land the chances of our survival would have been very low. A little after 09:00 we had just finished a phone call from Jane's family on the West Coast where it was still Christmas evening and we were retelling the part of the conversation the other of us had heard. There was a loud noise, a bang or something we could not identify topside and we rushed up to see what was going on. What we saw was not to be believed. The land astern of Callisto was about 6 feet above us and it was covered by 6 to 8 feet of water, which was cascading down into the harbor. We could not understand what was going on, but had no time to consider it. As we watched, Invincible broke free from her moorings and was coming in our direction. The moorings holding our pontoon to the shore broke free and every thing was a-swirl and we had to get clear of the wreckage around us. We could hear people in the building behind us screaming for help but there was nothing we could do. Jane ran up to free the line from the bow to the buoy and found it had already parted. There was nothing we could do about Invincible other than watch. She missed us by yards and proceeded out ahead of us. There was no time to retrieve our mooring lines, we just cut them and freed ourselves from the pontoon. All this time we were being pushed by a strong current towards the harbor entrance. We started the engine but did not engage the transmission for fear that loose lines would become entangled in the screw. We were worried about being jammed against the anti-swimmer net across the entrance of the harbor, but Invincible was ahead of us and carried the net away. The current we were in the grips of was washing us clear of the breakwaters and through the center of the entrance of the harbor out into the bay, following Invincible, so we took no action but to watch for hazards. Fishing boats and other craft were everywhere, mostly unmanned and in nests of three to five. There were two navy patrol craft tied together and adrift in the bay, they were manned but not propulsive. At this time we still did not understand what had happened. Walt's lack of understanding of the local geography allowed him to suppose that a dam had ruptured and caused the deluge of water we saw. It looked as if whatever the cause, the event was over and the current was slacking. The photo at the right looks across the bay to the harbor entrence where we were now drifting toward rocks (2). We checked for loose lines in the water and put the engine in gear for the first time only to discover that we had no rudder control. Now navigation became a primary concern. We were not familiar with the bay, but knew that there were rocks, shallows and other hazards around and buoys were not visible. Thinking that the cause of the catastrophe was over we thought the harbor would be the safest place for us to get sorted out. With Walt using the wind vane steering rudder and Jane at the throttle controls we managed to return safely to the harbor. What we failed to notice was that we were being helped by a building inrush of water as the next high water event was gathering power. Inside the harbor we found ourselves being pushed along the quay to which Invincible was originally moored. Walt tried to snag a bollard with a mooring line but by now the current was too strong and the mooring line was ripped from his grasp before he could get it down to a cleat. As it turned out this was a good thing because the in rushing water would rise several meters above the quay before it started to recede. By now Invincible had reentered the harbor and became one of the many threats that were in an anti-clockwise eddy around the southern basin. 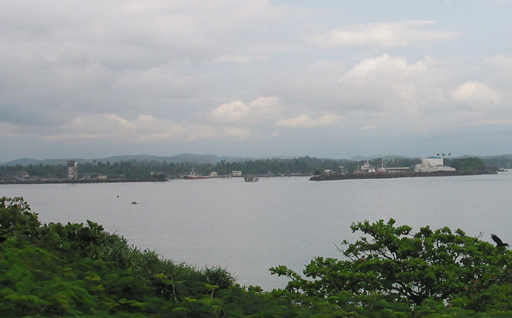 The harbor is divided into a southern basin and a northern basin by a large clinker pier running west from the mainland. Somehow we gained a position near the center of this southern basin and dropped the anchor (3). By this time the water was receding at a fast pace and Invincible was again bearing down on us. We managed to avoid Invincible by using the engine and letting out more anchor chain. As the water receded the drifting boats left the basin crashing into one another and the breakwaters as they exited. 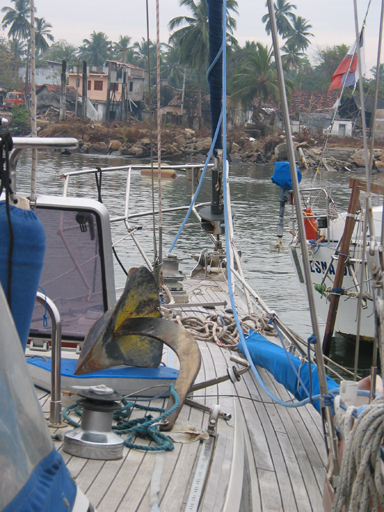 As we looked around the harbor we could see Sula still attached to the pontoons circulating in the northern basin. 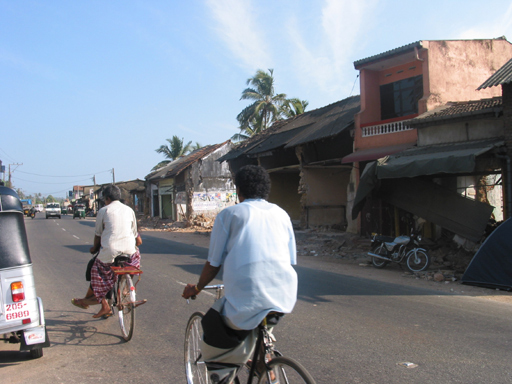 Sula's engine was out of commission at the time of the tsunami. A fishing boat had been tied to the quay near where Walt tried to snag the bollard, at the high water she was floating above the submerged quay, as the water receded she came down, not on the quay as we would have expected, but in her mooring clear of the quay and was now hanging from her mooring lines completely clear of the water. Had Walt snagged that bollard we would have ended up either on the quay or our cleats would have been ripped out as the water dropped from under us. We knew that the empty basin of the harbor would have to be refilled and could already see the current outside the entrance reversing direction. And by this time we had figured out that it was a tsunami. At some point Invincible had gone aground outside of the harbor and we thought at least she would not be back to ram into us, but that was a false hope. She refloated and came charging back into the harbor. As the water rushed back into the harbor we constantly had to fend off fishing boats and debris that were swirling around at high speed. The post event survey of Callisto reveled that we were not so successful. The force of the water coming into the harbor was beyond what we would have believed possible (8-10kts) and the strain on our anchor and chain was tremendous, but it held. We saw Invincible reenter the harbor but she headed for the North basin, again we hoped she would be trapped in the North basin and no longer be a hazard to us. We also saw Sula still afloat and circulating in the North basin ahead of Invincible. Again the water covered the quay and pier and all the land in the vicinity of the harbor. As the water receded fishing boats started to pile up in the corner of the breakwater and quay where we were originally moored. They collided, crashed on the rocks, sank or rolled over as was their want. The following day none were floating. In the ensuing clean up they recovered some 20 fishing boats from the bottom in that corner. Invincible again exited the harbor and on her way out she struck hard against the southern end of the northern breakwater. Surely, she was now immobilized and would cease to be a threat, but no, she freed herself and headed out into the bay. The water in the harbor again fell to an extreme low level and we knew that a repeat of the in rushing torrent would be coming. The cycle time from high water to high water is hard to gage because of the constant activity and effort to keep Callisto clear of all the hazards that constantly charged at us, but we think that it was nearly one hour. Half an hour to empty the harbor and half an hour to refill it. This time Invincible returned to the south basin and again threatened to ram us. As you might guess we were becoming somewhat paranoid when it came to this ship. She however, circulated around us and left as the basin again started to empty. The bow section of a large fishing boat that had broken in two was one of the pieces of flotsam we had to contend with. The bow was pointing straight up, but continued to float. It appeared this hazard too would pass clear of Callisto. What we did not know was that the nets, rigging and all other manner of tackle associated with a large fisherman was trailing from the bow section like the innards of a decapitated fish. As she was passing these nets, etc., became entangled in our anchor chain and the half of a boat effectively moored alongside Callisto. As the flow again reversed and the basin began to fill the weight of the nets was too much for our anchor and we were dragged across the harbor to the south side of the clinker pier (4). Thankfully, the water did not rise above the top of the pier this time, but it did come within an inch of doing so. We now had a new menace to contend with. A large ocean-going tug was moored to the south side of the pier and all but one of her mooring lines had parted. This tug was actually underway during the previous high water events, but her crew moored her to the pier and abandoned her. As the water again began to leave the harbor the tug swung around on her one remaining mooring line and attempted to crush Callisto against the pier. With Jane using the engine and Walt on the bow of Callisto pushing against the bow of the huge tug we just managed to scrape under her bow with only a bent bow pulpit for damage. After the tsunami the water mark on walls of the small building at the head of the clinker pier were 8 feet above the second floor. The south side of the pier we were pinned against has large (4' x 4') rigid fendering devices that stick out from the pier about 4'. The clinker ships rest against these rigid fenders while they are off loading. At the bottom of the low water these fendering devices were 6 feet above Callisto's deck. The in-rushing water refilling the basin held us tight against the pier and under one of these fendering devices. The two of us working together did not have the strength to push out from under this fender. We were trapped. The lower edge of the fender caught first on the bimini and then slipped to the primary winch on the port side of the cockpit, there was nothing further we could do and the water was going to rise another 5 feet. As the fender held us down and the water rose Callisto heeled hard over to port. Water was now pouring into the open galley port as our port side became submerged. Jane stepped off onto the pier fender while Walt rushed below to grab our getaway bag, we were sure that the fight was over and we had lost, Callisto would capsize. As the angle of heel became severe, the winch slipped out from under the fender and Callisto righted herself. In the process all the life lines were ripped off the port side and the bow and stern railings were bent out of shape as was the solar panel. The force involved in tearing out the lifelines on the port side was such that all the stanchions on the starboard side were bent too. The primary winch on the port side was shove down into the cockpit combing crushing the teak and fiberglass below it. 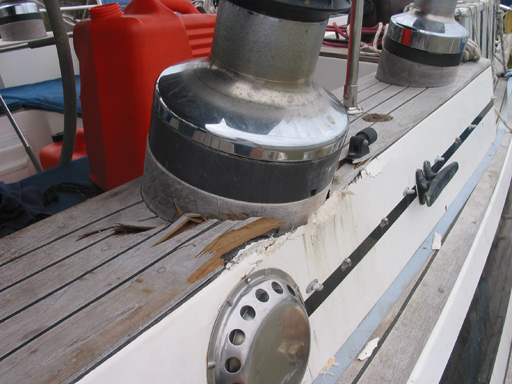 A section of the toe rail on the port side was ripped off the boat and our teak rub rail on that side was destroyed, but she floated. Jane re-boarded and we let the anchor chain out until the line on the bitter end of the chain was exposed. Walt buoyed the chain with a fender and cut the line. We warped ourselves to the end of the pier (5) to get away from the tug, the pier fendering system and to get less exposure to Invincible. There we spent the night pushing Callisto out from under huge truck tires that served as fenders for the end of the pier. The water continued to rise and fall as much as 6 feet above and 6 feet below normal level through out the night. Now each cycle the rise and fall of the water was less but still much above normal till the following morning and was still on a half-hour cycle. Invincible ended up in the south basin not 10 yards from the quay where she started and remained adrift and a threat for the next three days. Did we mention that the only souls aboard Invincible were a female cat and her kittens? Vesna went out of the harbor on the first wave and suffered rudder damage, (actually her skeg was ripped off and her rudder shaft bent about 40 degrees) she anchored in the bay and although taking on water remained safe until a tow back unto the harbor could be arranged two days later. Sula ended on her side on top of the fishing pier in the north of the harbor and would remain there for the next 10 days. We feel lucky that we were on board and not off on a shopping/sight-seeing excursion. Had we been ashore it is very likely that we would not have survived, many hundreds did not. 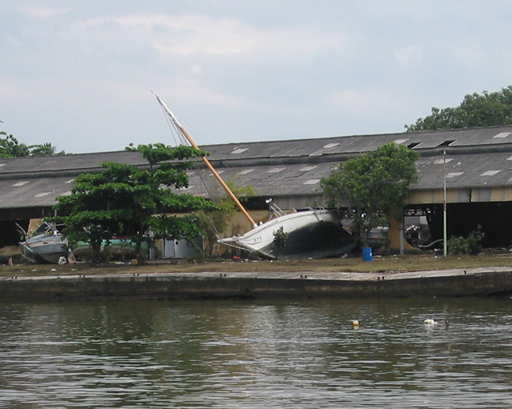 There were three unmanned yachts originally tied to the North side of the clinker pier, one of these, amazingly, remained in her moorings, another was stuffed into a warehouse some 50 feet behind the fishing pier (pictured) and the other was washed hard up on the rocks in front of town. Had we not been aboard, Callisto would have likely suffered a similar fate or ended up in the corner with all the fishing boats. As it is she suffered over twenty-thousand dollars worth of damage. In the following days we moved to the north side of the clinker pier (6) where we remained until we sailed for Thailand. 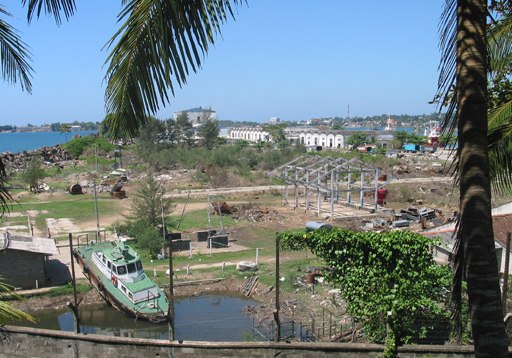 The dredge on the opposite side of the pier from Callisto is the sister ship of the one deposited on the quay by the tsunami. 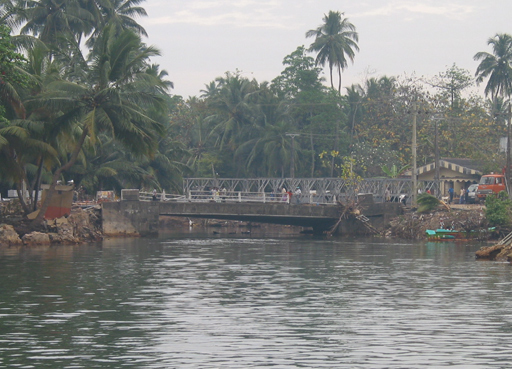 The first 10 days after the tsunami were the worst, the bridge linking Galle to the rest of Sri Lanka had been knocked off its supports and supplies would not start arriving until that was repaired. The cisterns that supplied water to the port were filled with salt water, as were the local wells used by villagers living around the port. The supermarket in the town had been destroyed. People's homes had been washed away with any food supplies they had on hand. People were desperate, there was no security in the port all the fences had been knocked down and we were afraid to leave Callisto unattended. We had food on board, but were short of water and diesel fuel. Deliveries of both fuel and water had been scheduled for 27 December. The Indian Naval Ship Sarvekshak arrived in Galle to provide disaster relief and moored across the clinker pier from us. On 5 January they provided us with 5 gallons of drinking water. By this time a temporary bridge had been installed and supplies started to arrive. Recovery of the anchor and chain was difficult. It was only accomplished thru a heroic effort by the Sri Lankan Navy divers. They were able to find the anchor and bring it up, but the chain was still in the grips of the fishing gear with which it had become entangled. 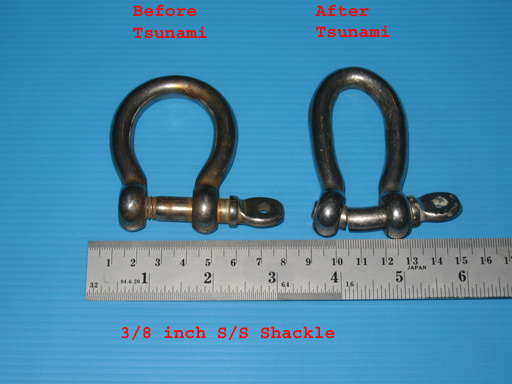 I have been warned many times not to use stainless steel shackles on my anchor, because stainless is more brittle and will break where mild steel will bend. My attitude was to never subject the anchor to that much strain. The deformation suffered by the shackle during the tsunami tends to belie the brittle stainless theory, but my current shackle is mild steel. No cranes or heavy lift equipment were available. The navy divers attached a chain fall to the opposite side of the pier and pulled the chain up section by section until the netting and fishing gear was clear of the water and then they could go no further. There was a ton of nets, boat parts and associated paraphernalia tightly wrapped to the chain. Walt and Jose from Vesna IV worked for a further two days, first pulling the nets up to the edge of the pier and then cutting them away with a box cutter. The nets would fall back into the water and process would be repeated. 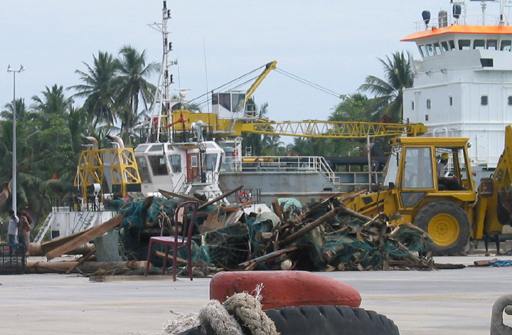 The debris pile in front of the backhoe was hanging from the bow section of a fishing boat that had broken in half during the tsunami. The whole mess attached itself to our anchor chain and caused us to drag anchor. Before the tsunami D.D. 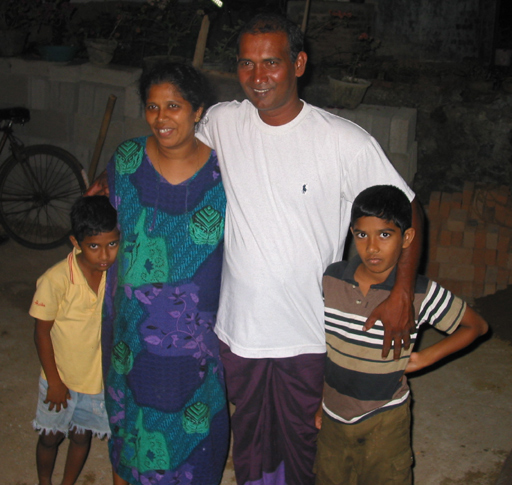 Nalin Kuruneru (Dee Dee to friends) pictured with his family, was our tuk-tuk driver, our friend and general assistant. Anything we needed he could help arrange for a fair price and he made sure we were not cheated. After the tsunami he was the only person to come and see if we needed any help or if we had even survived. This despite the fact that he had lost everything in his house and he lost his tuk-tuk. He brought us fresh fruit and things that could be purchased outside the tsunami damage zone. 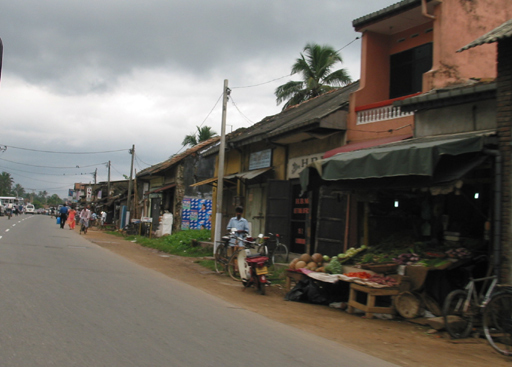 The pink building with the fruit stand in the left photo, taken before the tsunami is the same pink building in the right photo, taken after the tsunami. The residents of the pink building might have been fortunate in that they lived in the second story of the building unlike their neighbors. What was on the ground floor was washed away and never seen again. Many of the people perished. Our friend Dee Dee and his family lived on this street. They lived on the ground floor of a two story building and he was able to get his mother, wife and three children up the steps while their belongings were being washed away. 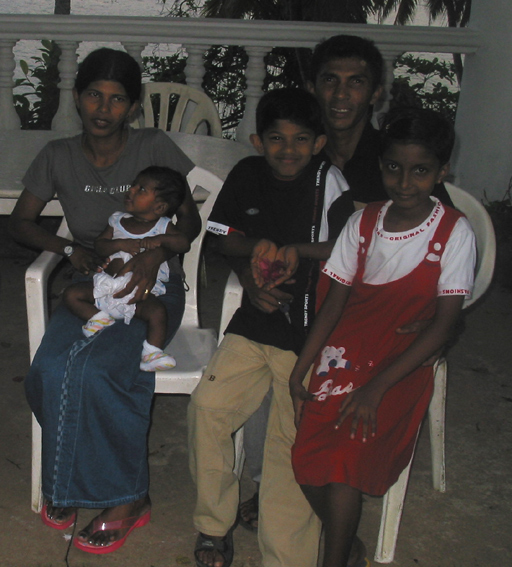 Mr. Upatissa Edirisinghe pictured with his wife and children was the representative of our agent in the port. He was also very helpful in the days after the tsunami. He helped us extend our visas, obtain fuel when it was finally available. He carried Walt on his motorbike with jerry jugs to get fuel from outside the damage zone, before it could be delivered to the port and provided other services that were greatly appreciated. 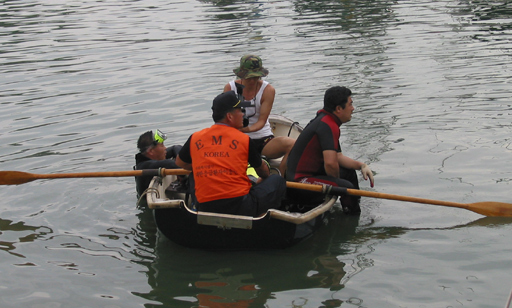 Part of the Korean relief effort included a team of divers to help with harbor clearance. 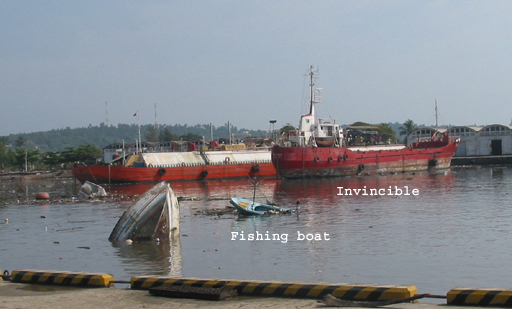 One of the Harbor Master's pilot boats had been moored to the north side of the clinker pier when the tsunami struck, it sank. The Korean salvage team was trying to raise the pilot boat and used Callisto's little dinghy as a diver support craft. The salvage effort was unsuccessful, because the pilot boat had rolled onto its side and under the pier. It then filled with sand. The weight of the sand was such that they could not right the boat without tearing it apart. 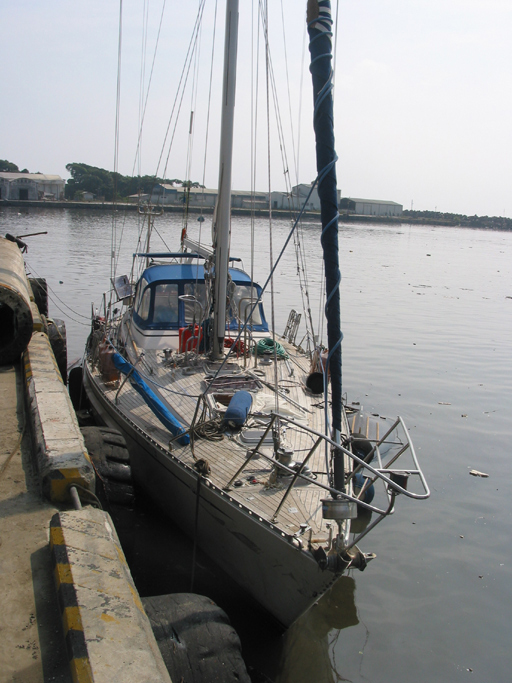 The Italian yacht Sula, that was moored next to Callisto before the tsunami, ended up on the fishing pier lying on her side. Just her mast is visible beyond the fishing boats in this photo. 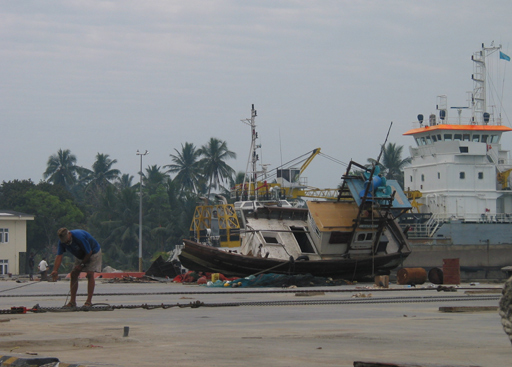 Most of the fishing fleet was at sea when the tsunami struck and have now returned. The number of fishing boats that been in port and broken their moorings and had come crashing into Callisto, the breakwaters and everything else on or near the water, made us believe it had been a fishing holiday. This picture contradicts that belief. It would be 10 days before Sula could be lifted and put back in the water. It turned out her damage was slight. It was 6 weeks before we could bring ourselves to go out and survey the damage and even then we felt strange taking pictures of someone else's disaster. The cleanup was well underway when these pictures were taken but it will take years before all the scars are removed. The photo on the left is the looking northeast from the Closenberg Hotel and the one on the right is the remains of a fishing village. The survivors. On the left: Antonino, single handing the yacht Sula. After Sula was lifted off the fishing pier and repairs were made to her bow pulpit, Antonino continued his circumnavigation back to Italy. Second from the left Jose, single handing the Slovenian yacht Vesna IV at the time of the tsunami. 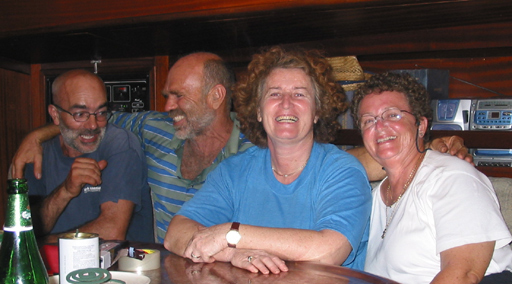 His wife Vesna, third from the left, joined him to help sail Vesna IV back to Slovenia. After Vesna IV was towed back into the harbor Jose hired a mobile crane to lift her onto the cement quay. He was able to repair the skeg and have the rudder shaft straightened. He and Vesna sailed their boat back to Slovenia. Next of course is Jane and Walt behind the camera. We know we were lucky when so many were not and we are grateful for that. 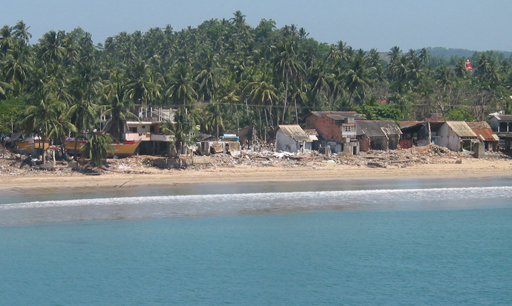 Callisto, on 15 February, was the last of the three boats to leave Galle. 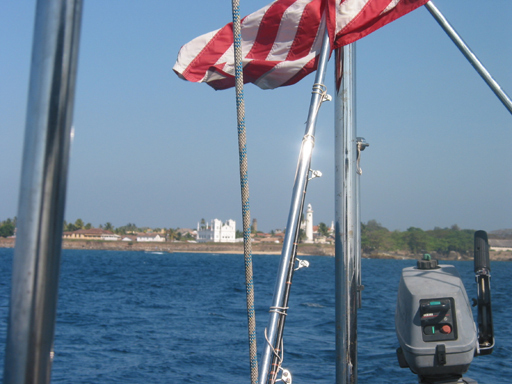 With Galle harbor in our wake our greatest regret is that we could not do more for those people who had lost so much.